Southern Neighbor was awarded the small business award by the Chapel Hill-Carrboro Chamber of Commerce. Southern Neighbor brings news of local business to residents, reaching more than 60,000 readers in the upscale, close-knit communities of greater Chapel Hill. Advertising with Southern Neighbor ensures you have an exclusive audience with this market. Additionally, Southern Neighbor staff play a key role advocating for small businesses in the community through campaigns such as Buy Local, small business spotlights, business profiles and an excellent relationship with the Chapel Hill-Carrboro Chamber of Commerce. Southern Neighbor has a readership of more than 50,000 residents, business owners, and visitors of Greater Chapel Hill in more than 50+ neighborhoods, including Fearrington Village, Governors Club, Meadowmont, The Oaks, The Reserve, and Southern Village. The home tax value in 80% of our bulk mailed neighborhoods is greater than $300,000, and 33% exceeds $500,000. * Southern Neighbor is a unique publication — the first of its kind to link these neighborhoods with the latest news, views and information. 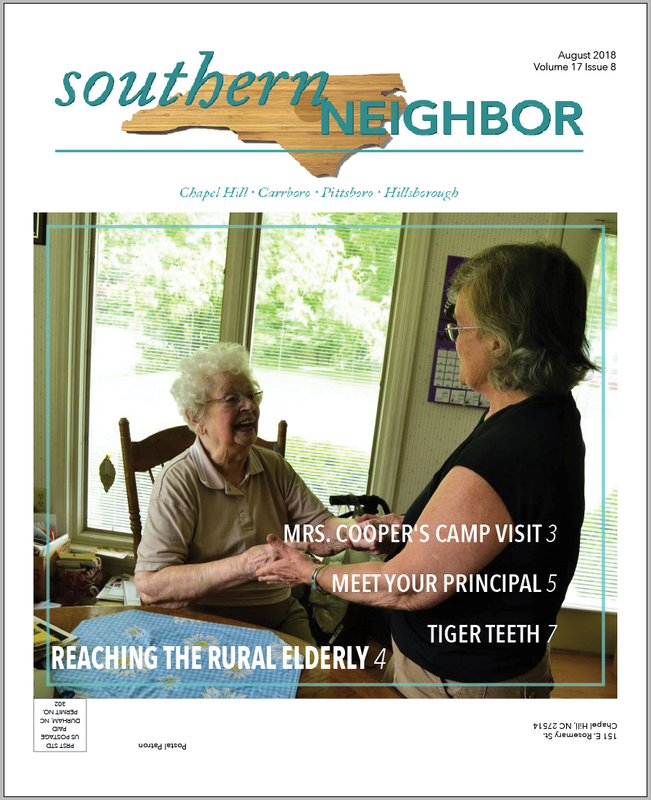 Southern Neighbor is distributed free each month to more than 20,000 homes in 50+ neighborhoods. Also look for our 4-color newspaper at more than 75 local organizations and businesses.